Old painted reclaimed box on wheels. 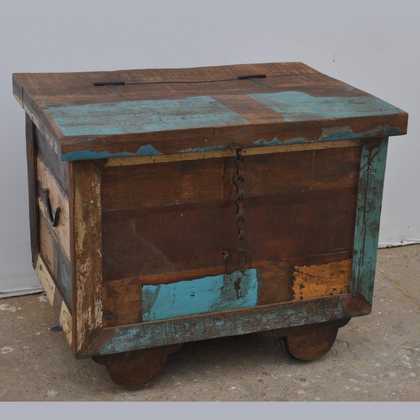 An eccentric but gorgeous solid wood trunk on wooden wheels. Made from a mix of reclaimed and new timber painted in distressed pastel colours of blues, creams and greens. It locks with an interesting thick iron chain and hasp on the front, and a split lid with a thinner restraining chain inside. Please Note: mix of colours may vary from the photo.